The United States Open Tennis Championships is a hard court tennis tournament. The tournament is the modern version of one of the oldest tennis championships in the world, the U.S. National Championship, for which men's singles was first played in 1881. Since 1987, the US Open has been chronologically the fourth and final Grand Slam tournament of the year. The other three, in chronological order, are the Australian Open, the French Open, and Wimbledon. The US Open starts on the last Monday of August and continues for two weeks, with the middle weekend coinciding with the U.S. Labor Day holiday. The tournament consists of five primary championships: men's and women's singles, men's and women's doubles, and mixed doubles. The tournament also includes events for senior, junior, and wheelchair players. Since 1978, the tournament has been played on acrylic hard courts at the USTA Billie Jean King National Tennis Center in Flushing Meadows–Corona Park, Queens, New York City. The US Open is owned and organized by the United States Tennis Association (USTA), a non-profit organization, and the chairperson of the US Open is Katrina Adams. Revenue from ticket sales, sponsorships, and television contracts are used to develop tennis in the United States. The US Open is the only Grand Slam tournament that employs tiebreakers in every set of a singles match. For the other three Grand Slam events, there are special scoring methods for a match that reaches 6–6 in the last possible set (the third for women and the fifth for men): in the French Open, the decisive set continues until a player takes a two-game lead, in Australia, an extended tiebreaker to 10 points is played, and at Wimbledon, a tiebreaker is played only if the game score reaches 12–12. As with the US Open, those events use tiebreakers to decide the other sets. The US Open also is the only Grand Slam tournament with 16 qualifiers (instead of 12) in the women's singles draw. 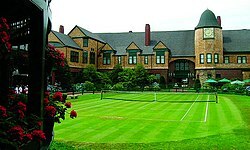 The tournament was first held in August 1881 on grass courts at the Newport Casino in Newport, Rhode Island. That year, only clubs that were members of the United States National Lawn Tennis Association (USNLTA) were permitted to enter. Richard Sears won the men's singles at this tournament, which was the first of his seven consecutive singles titles. From 1884 through 1911, the tournament used a challenge system whereby the defending champion automatically qualified for the next year's final, where he would play the winner of the all-comers tournament. In 1915, the national championship was relocated to the West Side Tennis Club in Forest Hills, Queens, New York City. The effort to relocate it to New York City began as early as 1911 when a group of tennis players, headed by New Yorker Karl Behr, started working on it. In the first years of the U.S. National Championship, only men competed and the tournament was known as the U.S. National Singles Championships for Men. In 1887, six years after the men's nationals were first held, the first U.S. Women's National Singles Championship was held at the Philadelphia Cricket Club. The winner was 17-year-old Philadelphian Ellen Hansell. This was followed by the introduction of the U.S. Women's National Doubles Championship in 1899 and the U.S. Mixed Doubles Championship in 1892. The women's tournament used a challenge system from 1888 through 1918, except in 1917. Between 1890 and 1906, sectional tournaments were held in the east and the west of the country to determine the best two doubles teams, which competed in a play-off for the right to compete against the defending champions in the challenge round. In early 1915, a group of about 100 tennis players signed a petition in favor of moving the tournament. They argued that most tennis clubs, players, and fans were located in the New York City area and that it would therefore be beneficial for the development of the sport to host the national championship there. This view was opposed by another group of players that included eight former national singles champions. This contentious issue was brought to a vote at the annual USNLTA meeting on February 5, 1915, with 128 votes in favor of and 119 against relocation. From 1921 through 1923, the tournament was played at the Germantown Cricket Club in Philadelphia. It returned to the West Side Tennis Club in 1924 following completion of the 14,000-seat Forest Hills Stadium. Although many already regarded it as a major championship, the International Lawn Tennis Federation officially designated it as one of the world's major tournaments commencing in 1924. At the 1922 U.S. National Championships, the draw seeded players for the first time to prevent the leading players from playing each other in the early rounds. The open era began in 1968 when professional tennis players were allowed to compete for the first time at the Grand Slam tournament held at the West Side Tennis Club. The previous U.S. National Championships had been limited to amateur players. Except for mixed doubles, all events at the 1968 national tournament were open to professionals. That year, 96 men and 63 women entered, and prize money totaled US$100,000. In 1970, the US Open became the first Grand Slam tournament to use a tiebreaker to decide a set that reached a 6–6 score in games. From 1970 through 1974, the US Open used a best-of-nine-point sudden-death tiebreaker before moving to the International Tennis Federation's (ITF) best-of-twelve points system. In 1973, the US Open became the first Grand Slam tournament to award equal prize money to men and women, with that year's singles champions, John Newcombe and Margaret Court, receiving US$25,000 each. Beginning in 1975, the tournament was played on clay courts instead of grass, and floodlights allowed matches to be played at night. In 1978, the tournament moved from the West Side Tennis Club to the larger and newly constructed USTA National Tennis Center in Flushing Meadows, Queens, three miles to the north. The tournament's court surface also switched from clay to hard. Jimmy Connors is the only individual to have won US Open singles titles on three surfaces (grass, clay, and hard), while Chris Evert is the only woman to win US Open singles titles on two surfaces (clay and hard). The US Open is the only Grand Slam tournament that has been played every year since its inception. During the 2006 US Open, the complex was renamed to "USTA Billie Jean King National Tennis Center" in honor of Billie Jean King, a four-time US Open singles champion and women's tennis pioneer. From 1984 through 2015, the US Open deviated from traditional scheduling practices for tennis tournaments with a concept that came to be known as "Super Saturday": the men's and women's finals were played on the final Saturday and Sunday of the tournament respectively, and their respective semifinals were held one day prior. The Women's final was originally held in between the two men's semi-final matches; in 2001, the Women's final was moved to the evening so it could be played on primetime television, citing a major growth in popularity for women's tennis among viewers. This scheduling pattern helped to encourage television viewership, but proved divisive among players because it only gave them less than a day's rest between their semi-finals and championship match. For five consecutive tournaments between 2007 through 2012, the men's final was postponed to Monday due to weather. In 2013 and 2014, the USTA intentionally scheduled the men's final on a Monday—a move praised for allowing the men's players an extra day's rest following the semifinals, but drew the ire of the ATP for further deviating from the structure of the other Grand Slams. In 2015, the Super Saturday concept was dropped, and the US Open returned to a format similar to the other Grand Slams, with men's and women's finals on Saturday and Sunday. However, weather delays forced both sets of semifinals to be held on Friday that year. Arthur Ashe Stadium in 2018 with the roof open. 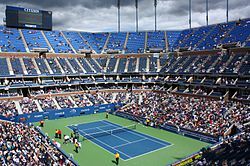 The grounds of the US Open have 22 outdoor courts (plus 12 practice courts just outside the East Gate) consisting of four "show courts" (Arthur Ashe Stadium, Louis Armstrong Stadium, the Grandstand, and Court 17), 13 field courts, and 5 practice courts. All the courts used by the US Open are illuminated, allowing matches and television coverage to extend into primetime. In 2001, the women's singles final was intentionally scheduled for primetime for the first time. CBS Sports president Sean McManus cited significant public interest in star players Serena Williams and Venus Williams and the good ratings performance of the 1999 women's singles final, which was pushed into primetime by rain delays. Since 1978, the US Open has been played on a hard court surface called Pro DecoTurf. It is a multi-layer cushioned surface and classified by the International Tennis Federation as medium-fast. Each August before the start of the tournament, the courts are resurfaced. Since 2005, all US Open and US Open Series tennis courts have been painted a shade of blue (trademarked as "U.S. Open Blue") inside the lines to make it easier for players, spectators, and television viewers to see the ball. The area outside the lines is still painted "U.S. Open Green". In 2006, the US Open introduced instant replay reviews of line calls, using the Hawk-Eye computer system. It was the first Grand Slam tournament to use the system. According to many experts,[who?] the system was implemented because of a controversial quarterfinal match at the 2004 US Open between Serena Williams and Jennifer Capriati, where important line calls went against Williams. Instant replay was available only on the Arthur Ashe Stadium and Louis Armstrong Stadium courts through the 2008 tournament. In 2009, it became available on the Grandstand court. Starting in 2018, all competition courts are outfitted with Hawk-Eye and all matches in the main draws (Mens and Womens Singles and Doubles) follow the same procedure- each player is allowed 3 incorrect challenges per set, with one more being allowed in a tiebreak. In 2007, JP Morgan Chase renewed its sponsorship of the US Open and, as part of the arrangement, the replay system was renamed to "Chase Review" on in-stadium video and television. The men's and women's singles prize money (US$40,912,000) accounts for 80.9 percent of total player base compensation, while men's and women's doubles (US$6,140,840), men's and women's singles qualifying (US$3,008,000), and mixed doubles (US$505,000) account for 12.1 percent, 5.9 percent, and 1.0 percent, respectively. The prize money for the wheelchair draw amounts to a total of US$350,000. The singles winners of the men and women draws receive US$31,200 and the winner of the quad singles receives US$23,400. The United States Tennis Association in 2012 agreed to increase the US Open prize money to US$50,400,000 by 2017. As a result, the prize money for the 2013 tournament was US$33.6 million, a record US$8.1 million increase from 2012. The champions of the 2013 US Open Series also had the opportunity to add US$2.6 million in bonus prize money, potentially bringing the total 2013 US Open purse to more than US$36 million. In 2014, the prize money was US$38.3 million. In 2015, the prize money was raised to US$42.3 million. Novak Djokovic won the men's singles title. This was his third US Open singles title and fourteenth Grand Slam singles title. Naomi Osaka won the women's singles title. This was her first Grand Slam title, becoming the first Japanese player to win the Grand Slam singles title. Mike Bryan was part of the winning men's doubles team in 2018. This was his seventh US Open title, it was his eighteenth Grand Slam Men's Doubles title and twenty-second Grand Slam title overall. Jack Sock was part of the winning men's doubles team in 2018. This was his second US Open title, it was his third Grand Slam Men's Doubles title, and fourth Grand Slam title overall. Ashleigh Barty was part of the winning women's doubles team in 2018. This was her first Grand Slam doubles title by previously reaching the final in 2013. CoCo Vandeweghe was part of the winning women's doubles team in 2018. This was her first Grand Slam doubles title. Bethanie Mattek-Sands was part of the winning Mixed Doubles team in 2018. This was her third Mixed Doubles title and her second title at the US Open. Jamie Murray was part of the winning Mixed Doubles team in 2018. This was his second US Open mixed doubles title, third US Open title overall, fourth Grand Slam mixed doubles title, and sixth Grand Slam title overall. The US Open's website allows viewing of live streaming video, but unlike other Grand Slam tournaments, does not allow watching video on demand. The site also offers live radio coverage. Brunei: Fox Sports Asia has the exclusive right to broadcast the event from 2017 through 2021. Cambodia: Fox Sports Asia has the exclusive right to broadcast the event from 2017 through 2021. East Timor: Fox Sports Asia has the exclusive right to broadcast the event from 2017 through 2021. Hong Kong: Fox Sports Asia has the exclusive right to broadcast the event from 2017 through 2021. Indonesia: Fox Sports Asia has the exclusive right to broadcast the event from 2017 through 2021. Ireland: From 2018 through 2022, Amazon Prime Video is broadcasting the US Open. Laos: Fox Sports Asia has the exclusive right to broadcast the event from 2017 through 2021. Macau: Fox Sports Asia has the exclusive right to broadcast the event from 2017 through 2021. Malaysia: Fox Sports Asia has the exclusive right to broadcast the event from 2017 through 2021. Mongolia: Fox Sports Asia has the exclusive right to broadcast the event from 2017 through 2021. Myanmar: Fox Sports Asia has the exclusive right to broadcast the event from 2017 through 2021. Papua New Guinea: Fox Sports Asia has the exclusive right to broadcast the event from 2017 through 2021. Philippines: Fox Sports Asia has the exclusive right to broadcast the event from 2017 through 2021. Singapore: Fox Sports Asia has the exclusive right to broadcast the event from 2017 through 2021. South Korea: Fox Sports Asia has the exclusive right to broadcast the event from 2017 through 2021. Taiwan: Fox Sports Asia has the exclusive right to broadcast the event from 2017 through 2021. Thailand: Fox Sports Asia has the exclusive right to broadcast the event from 2017 through 2021. United Kingdom: From 2018 through 2022, Amazon Prime Video is broadcasting the US Open. United States (including its Pacific territories): Tennis Channel. ESPN took full control of televising the event in 2015, ending CBS's 46-years of coverage. Vietnam: Fox Sports Asia has the exclusive right to broadcast the event from 2017 through 2021. ^ Except Arthur Ashe Stadium and Louis Armstrong Stadium during rain delays. ^ The last American to win the men's singles title was Andy Roddick in 2003. ^ The last American to win the women's singles title was Sloane Stephens in 2017. ^ Ashley Marshall (July 17, 2018). "2018 US Open Prize Money to reach $53 Million". United States Tennis Association. Retrieved August 25, 2018. ^ "National Lawn-Tennis Tournament" (PDF). The New York Times. July 14, 1881. Retrieved July 15, 2012. ^ a b c d Bud Collins (2010). The Bud Collins History of Tennis (2nd ed.). New York City: New Chapter Press. pp. 10, 452, 454. ISBN 978-0942257700. ^ "Tennis Tournament at Newport Again" (PDF). The New York Times. February 4, 1911. Retrieved July 16, 2012. ^ a b Bill Shannon (1981). United States Tennis Association Official Encyclopedia of Tennis (Centennial edition). New York City: Harper & Row. pp. 237–249. ISBN 0-06-014896-9. ^ "Newport May Lose Tennis Tourney" (PDF). The New York Times. January 17, 1915. Retrieved July 16, 2012. ^ "Want Newport for Tennis Tourney" (PDF). The New York Times. January 18, 1915. Retrieved July 16, 2012. ^ "A Tennis "Solar Plexus"" (PDF). The New York Times. January 23, 1915. Retrieved July 16, 2012. ^ "Tourney Goes to New York". Boston Evening Transcript. February 6, 1915. Retrieved July 16, 2012. ^ "'All-Comers' Tourney to be Restricted" (PDF). The New York Times. February 7, 1915. Retrieved July 16, 2012. ^ "Newport Loses Tennis Tourney" (PDF). The New York Times. February 6, 1915. Retrieved July 21, 2012. ^ "Germantown Cricket Club History". Germantown Cricket Club. Archived from the original on April 3, 2012. Retrieved December 15, 2013. ^ "Recommendation is made for the abolition of blind draw in promotion of tennis tourneys". Newspapers.com. Evening Public Ledger. December 19, 1921. p. 21. ^ E. Digby Baltzell. Sporting Gentlemen: Men's Tennis from the Age of Honor to the Cult of the Superstar. New Brunswick: Transaction Publishers. p. 182. ISBN 978-14128-5180-0. ^ "Grand Slams – US Open". International Tennis Federation. Retrieved August 23, 2012. ^ Richard Sandomir (August 3, 2006). "Tennis Center to Be Named for Billie Jean King". The New York Times. ^ a b "Ladies first – women's open final is so hot, they're moving it to prime-time". New York Post. Retrieved September 12, 2016. ^ a b "ATP blasts US Open over Monday final". ESPN.co.uk. Retrieved August 31, 2015. ^ a b "Traditional US Open scheduling favors Federer". ESPN.go.com. Retrieved August 31, 2015. ^ "US Open schedules Monday finish". ESPN.co.uk. Retrieved August 31, 2015. ^ "U.S. Open schedule: How to watch semifinal matches". Sports Illustrated. Retrieved September 12, 2015. ^ "USTA ARTHUR ASHE STADIUM". Rossetti. Retrieved August 25, 2018. ^ a b c Cindy Shmerler (August 20, 2018). "What's New, and What's Free, at the 2018 U.S. Open". The New York Times. Retrieved August 28, 2018. ^ a b David W. Dunlap (August 29, 2016). "How the Roof Was Raised at Arthur Ashe Stadium". The New York Times. Retrieved August 25, 2018. ^ Tim Newcomb (August 8, 2018). "Finishing Touches at U.S. Open's Home". VenuesNow. Retrieved August 28, 2018. ^ a b c Howard Beck (September 4, 2011). "A Tiny New Stage for High-Energy Tennis". The New York Times. Retrieved August 25, 2018. ^ "USTA Tennis Championships Magazine: 2018 US Open Edition". United States Tennis Association. p. 26. Retrieved August 28, 2018. ^ Thomas Lin (September 7, 2011). "Speed Bumps on a Hardcourt". The New York Times. Retrieved August 25, 2018. ^ a b Tim Newcomb (August 24, 2015). "The science behind creating the U.S. Open courts and signature colors". Sports Illustrated. ^ Chris Broussard (September 9, 2004). "Williams Receives Apology, and Umpire's Open Is Over". The New York Times. ^ "Chase signs mega renewal with Open". Retrieved September 9, 2016. ^ "US Open History – Year-by-Year". United States Tennis Association (USTA). ^ "US Open sets attendance record". US Open. September 9, 2018. ^ "U.S. Open Tennis - Total Attendance (By Year)". www.baruch.cuny.edu. City University of New York. ^ a b "2018 US Open Prize Money". United States Tennis Association. Retrieved August 29, 2018. ^ "US Open makes long-term commitment to the game". United States Tennis Association. Retrieved June 25, 2013. ^ "US prize money upped" DPA International, July 14, 2014. ^ "All about rankings". www.wtatennis.com. Women's Tennis Association (WTA). ^ a b c d "Youngest and oldest champions". United States Tennis Association. Retrieved October 17, 2017. ^ a b c d e f g h i j k l m n o p q r s t u v w x y z aa ab ac ad ae af ag ah ai aj ak al am an ao ap aq ar as at au av aw ax ay az ba bb bc bd be bf bg bh bi bj bk bl bm bn bo bp bq br bs bt bu bv bw bx by bz ca cb cc cd ce cf cg ch ci cj ck cl cm cn co cp cq cr cs ct cu cv cw cx cy cz da db dc dd de df dg dh di dj dk dl dm dn do dp dq dr ds dt du dv dw dx dy dz ea eb ec ed ee ef eg eh ei ej ek el em en eo ep eq er es et eu ev ew ex ey ez fa fb fc fd fe ff fg fh fi fj "International TV Schedule". United States Tennis Association. Retrieved August 30, 2018. ^ "Calendário de tênis na TV em 2018; veja onde assistir". Esporte e Midia. December 22, 2017. Retrieved March 16, 2019. ^ a b c d e f g h i j k l m n o p q "Fox Sports Asia completes tennis Grand Slam with the acquisition of the US Open". Casbaa. May 19, 2016. Retrieved August 25, 2018. ^ a b "US Open: Amazon to show Grand Slam online in UK & Ireland from 2018". BBC Sport. April 18, 2018. Retrieved April 20, 2018. ^ "ESPN to Gain Full Rights to U.S. Open in 2015". The New York Times. Retrieved August 25, 2018.